When you start writing your own code/library for a device, the first place to look is the device datasheet. ST7920 is a chip manufactured by Sitronix and has support for Chinese alphabet. 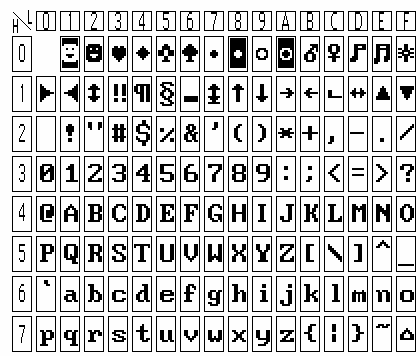 Don't worry, it can display also the English alphabet with 8x16 characters. 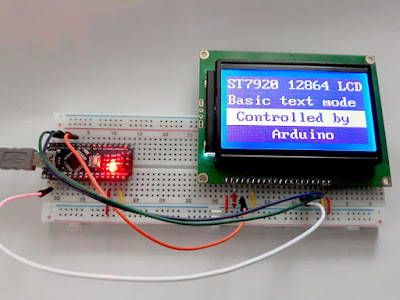 Connecting the display in serial mode is easy. 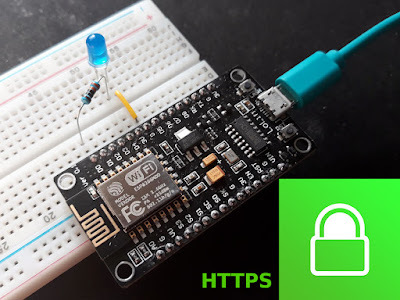 You need to set PSB pin to 0 (connect it to GND) to inform the controller that you will be sending serial data. Then, RS becomes CS, RW becomes MOSI and EN becomes SCK. It is also recommended to connect the reset pin. Look on the back of your LCD board. 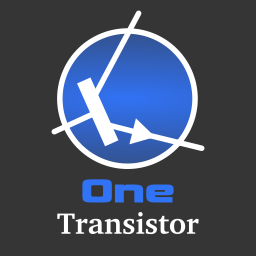 If it has a preset trimmer resistor, that can be used for contrast adjustment and you don't need to connect anything to VO pin.You should also note that some manufacturers hardwire the LCD to either parallel or serial mode. Use a continuity tester (ohmmeter) to check if PSB is connected to VCC or GND. I connected the LCD to Arduino SPI pins, because I want to use hardware SPI. The RST pin can connect to any digital output pin. it is good practice to connect D12 (MISO) to GND because it is an input pin left floating. According to datasheet, SPI clock cycle should be at least 600ns. This means a maximum frequency of 1.66 MHz. However, I couldn't get output on display with frequencies higher than 400 kHz. I don't know if it's ATmega328 or ST7920 fault. Let's have a look at the datasheet and see how a single byte is sent in serial mode. SPI bus is configured for mode 3 (data read on clock falling edge), with MSB first. Wikipedia has a good article on SPI modes. 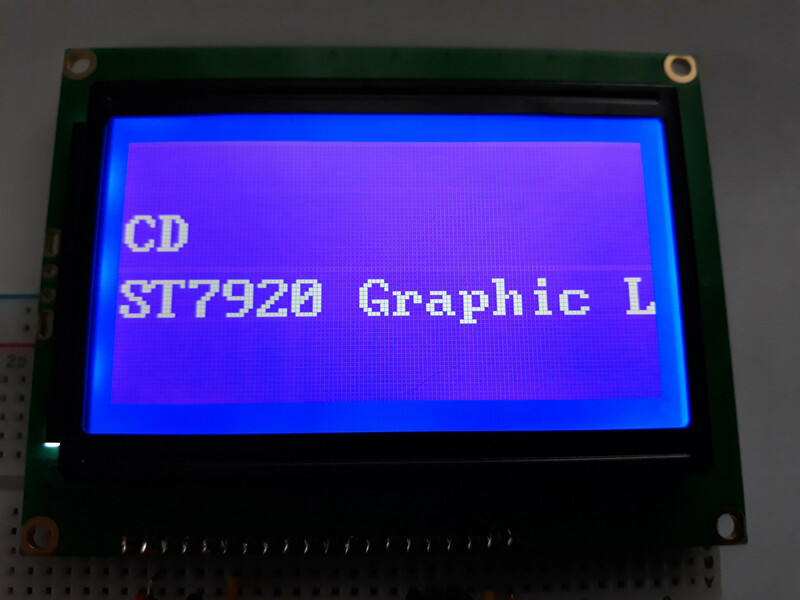 Since we know how to transfer data to LCD, let's perform its initialization. To improve code readability, Zhongxu used some definitions for ST7920 registers. Function set clears RE bit (switches to basic instruction). Display clear fills character ram with spaces and resets address counter. Entry mode set configures cursor direction to right (I/D=1) and disables display shift. 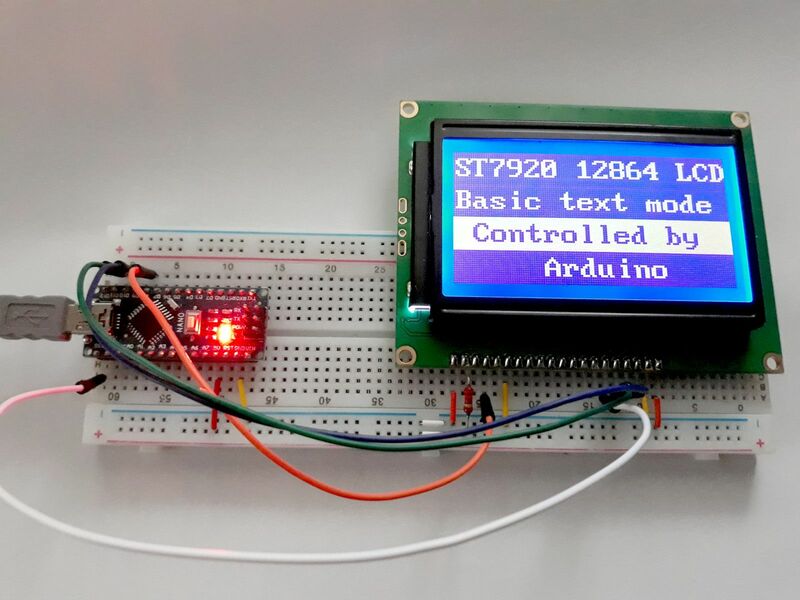 Display control turns display on (D=1) and disables cursor display and blink. Now, the display is ON and awaiting text to be displayed. Let's see how character RAM is organised. If you start sending a character array to ST7920 the address counter will increment automatically and fill the first row (Line 1 of text) with 16 characters. Then it jumps to the third row (Line 2 of text) and fills it with the next 16 characters. After that comes second row (Line 3 of text) and fourth row (Line 4 of text). Placing text at specified position requires setting RAM address. This is performed by LCD_COMMAND with an address from above table. For 'B' character, it's enough to send only this character. The one next to it will remain unchanged unless you sent something. Next time, I will switch to graphic mode and create a simple, mixed text-graphic menu with selection highlight (like you see in the top photo). 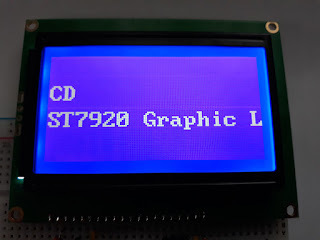 This code is adapted from Experimenting with ST7920 128×64 graphical LCD on a PIC and zhongxu/avr.ST7920. 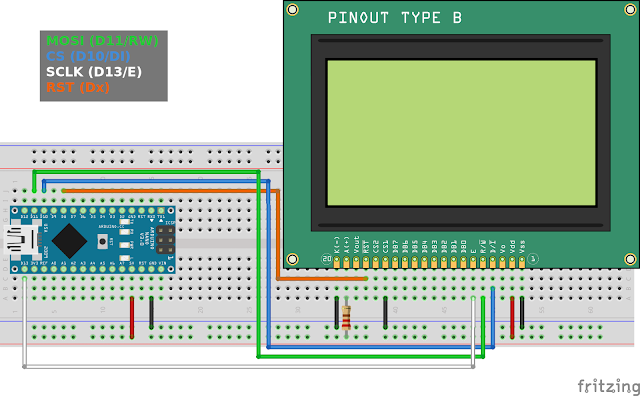 My complete Arduino sketch can be download from here.